I think this reader is good, the only problem is that it won’t show any thumbnail(aka first image in the folder) or maybe i missed it ? As you have noticed, there is not any thumbnail support in Kuroneko Reader at the moment. I do agree with you, though– I tend to recognize content by the cover rather than the title as well. I’ve taken note of your request. Ideally, I’d like to include this in a library management application that integrates the reader for actually viewing content (i.e., a successor to Manga Database that features thumbnails). Thank you for your feedback! I’ve got quite the backlog of HDoujin updates to work on (as the primary product, it takes priority), but once that’s finished I’ll move on to updating the extra modules. Can you make it so that I can change the control key,like forward and zoom and etc.thz! If I understand the request correctly, you want to be able to customize Kuroneko Reader’s keyboard shortcuts? This is something that has been requested quite often in the past, so it’s definitely on my to-do list! I have some other requests I need to take care of involving HDoujin first, but when I finish with them I’ll move on to implementing people’s requests for the modules. What is the benefits of using this reader than using other photo readers? Almost every specified features of Kurenko reader is also avaliable on other readers. 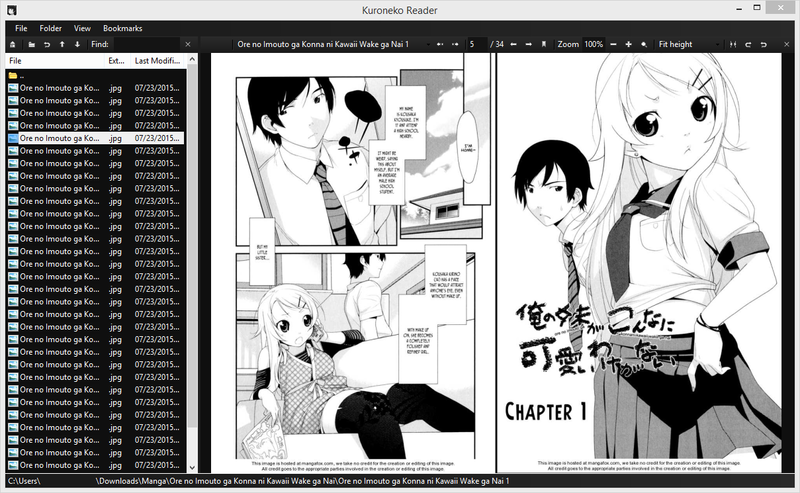 Kuroneko Reader is a work-in-progress (hence the “beta” label) and is an entirely optional add-on, so if you prefer a different reader that offers similar features, that’s perfectly fine. I’m going to continue adding features to it as time goes on, so feel free to check back later if you’re interested. Would it be possible to add touch screen / tablet support in the future (such as swiping or pressing the side of the screen to move the page)? I’m probably part of the rare few (possibly the only one) who purchased the program and uses a Windows tablet and it would great if I could use it to read from Kuroneko when I’m out. Also as a minor suggestion, maybe add the option for an animation when turning pages? Yes, touch support should be fairly easy to add; I’ve added it to my to-do list. The page-turning animation is unlikely for a while (because of how things are set up at the moment), but I’d like to add that at some point, too. Please note, though, that Kuroneko Reader isn’t updated as frequently as HDoujin (updates for the latter are higher-priority), so it might take a little while while I work on other things. That’s fine. Thanks for the reply and also in advance for when the feature is added! I was wondering if it’s currently planned to be able to go to the next page and previous page by key binding or scrolling up/down with the mouse wheel. I’m coming from honeyview to kuroneko and one thing I enjoyed was the ability to set key bindings for next/prev page as well as that if you scroll to the bottom and attempt to scroll further it will go to the next page. It does this as well when scrolling back up to the top of an image, scrolling up will cause it to go back to the previous page. I find this really nice for the fit width views. Thanks for the feedback! I’ve received requests from a couple of other people that wanted something similar. Configurable key bindings are planned for the next release of Kuroneko Reader. Also, I agree, being able to change pages with the mouse wheel would be useful. Expect to see that in the next release as well. It’ll be in a folder called “modules” in the same folder as HDoujin. Hey, i somehow cant download the reader and database anymore since the latest update. It says “Update failed (could not extract reg.zip)” But it isnt actually downloading the reg.zip and then tries to open a empty .zip file. The issue was related to the recent DDoS. I’ve since fixed it in Release 29 (you’ll be able to download this update normally through the updater). After updating, it should work as expected. Can you make it so that it works offline too? Also the database doesn’t work for me. It won’t scan my locations. Sure. It is now possible to run both Kuroneko Downloader and Manga Database offline; to update them, use the “Download Now” button in the updater and it’ll download the latest versions of both. As for the database not working, did it scan the initial folder (the one you specify when you first run the program) correctly? Is it able to scan any directory correctly? If you’re having trouble getting it to scan directories you added to the watch list in the settings menu, click Edit > Run Library Scanner (the latest version will scan new directories right after they’re added, though). The scanning progress notification should appear in the lower left corner of the program.